In a large big bowl add sugar and oil and whisk them. Sieve maida and add all dry ingredients; cocoa powder, baking soda and baking powder. Mix dry and wet ingredients add vanilla essence and melted chocolate or chocolate chips. Grease and line a square pan and pre heat oven at 180'C temp for 10 minutes. Pour mixture into the heated pan and garnish walnuts over it and bake for 30 - 35 minutes at 180'C. Test it using a toothpick after 30 minutes. 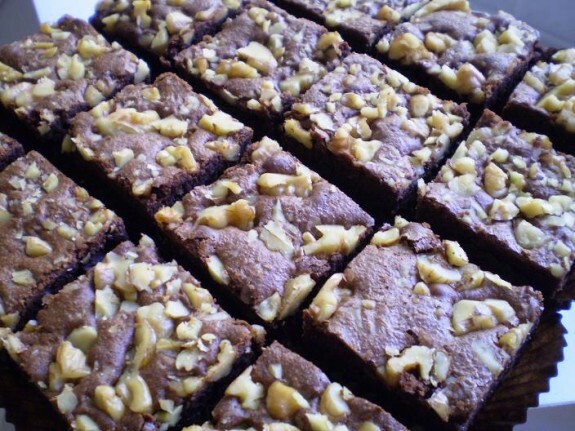 If it is soft chewy gooey, your brownie is ready. Cut into small squares and serve with chocolate sauce and a vanilla scoop.